Waking up a glorious, Tupac Tuesday to discover he’s actually on a skateboard may leave us ladies in shock. But yes it’s true, one of our favorite female streetwear brands, Dimepiece LA has taken their Spring collection to a new level this year. The lookbook is amazing. The pages are filled with Cam’ron in his infamous pink fur and Baby Phat phone and we also see a young Pharrell, if that’s even possible to say. But what really standouts among the collection is the Gangster Chic Deck. If you were put on earlier, you would know about the Tupac floral iphone case. Your favorite Bad “It” Girl, Rihanna has a few. But now it’s time for us ladies to get our skateboard on and why not try it out with our favorite poet and one of the greatest to do it, Tupac Shakur. 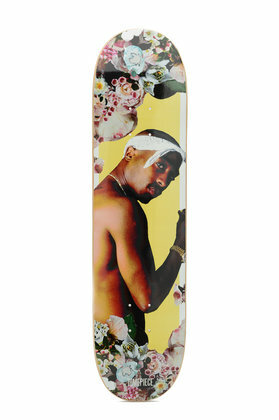 The deck does keep it extra girly with a nice floral print as well and one of the most known pictures of Tupac. It retails for $89 USD, cop it here and add to your list of vices!